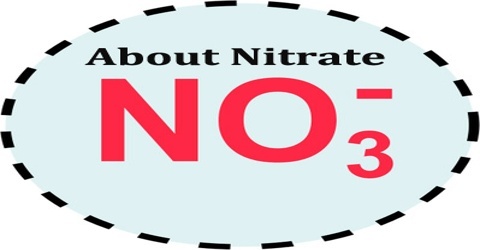 Nitrate is a salt or ester of nitric acid, containing the group NO3. Nitrates dissolve extremely easily in water and are an important component of the nitrogen cycle. It is composed of the elements oxygen and nitrogen, and is an important source of nitrogen for plant and animal life; but too much nitrate in drinking water can be harmful to human health. 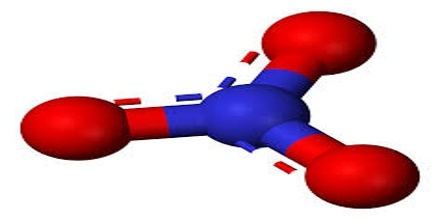 Nitrates also describe the organic functional group RONO2. These nitrate esters are a specialized class of explosives. Common sources of nitrate in water include plant and animal matter, human and animal waste, household septic systems, and fertilizers. Because it dissolves readily in water, nitrate from these sources is usually present at least in low concentrations in drinking-water supplies, regardless of the water source. 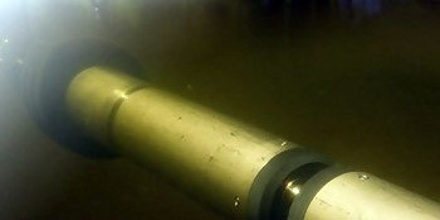 The historical standard method of testing for nitrate is the Cadmium Reduction Method, which is reliable and accurate although it is dependent on toxic metal cadmium and thus not suitable for all applications. Nitrate is naturally found in plants and in vegetables and can be found in groundwater, depending on how much fertilizer and manure is applied to fields. The largest natural deposits of sodium nitrate are located in Chile and Peru. The War of the Pacific (1879-1884) was over control of these deposits and pitted Chile against Peru and Bolivia. Early in the 20th century, synthetic sodium nitrate began to be produced, and by the 1940’s, the demand for naturally-produced sodium nitrate dropped dramatically. The anion is the conjugate base of nitric acid, consisting of one central nitrogen atom surrounded by three identically bonded oxygen atoms in a trigonal planar arrangement. The nitrate ion carries a formal charge of −1. 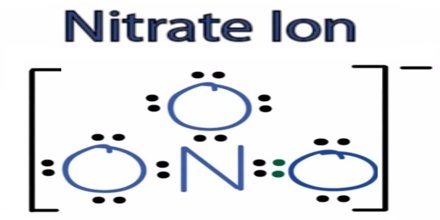 This results from a combination formal charge in which each of the three oxygens carries a − 2⁄3 charge, whereas the nitrogen carries a +1 charge, all these adding up to formal charge of the polyatomic nitrate ion. 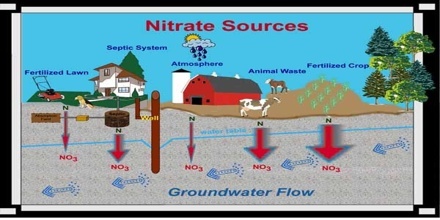 Common sources of nitrate include nitrogen fertilizers, manure, septic systems and sewage treatment practices. Nitrate can be carried into the groundwater by rainwater and melting snow that percolates through the soil and bedrock into the underlying aquifer. Nitrates are the most water soluble of all salts, and play a major part in nitrogen cycle and nitrate pollution. The main nitrate fertilizers are ammonium, sodium, potassium, and calcium salts. Several million kilograms are produced annually for this purpose. The second major application of nitrates is as oxidizing agents, most notably in explosives where the rapid oxidation of carbon compounds liberates large volumes of gases. Sodium nitrate is used to remove air bubbles from molten glass and some ceramics. Mixtures of the molten salt are used to harden some metals. Nitrates are not generally harmful unless they are consumed in massive quantities. Nitrites, on their own and in moderation, are also generally not harmful. However, nitrites can be degraded into carcinogenic compounds by high heat and also by digestive enzymes. Nitrites are particularly good at preventing botulism – an anaerobic form of bacteria that causes paralysis and death – which is why small amounts of these compounds are added to cured meats. Neither nitrates nor nitrites are good at preventing contamination by other kinds of bacteria like E. coli. Reference: uky.edu, wisconsinwatch.org, dictionary.com, study.com, wikipedia.